Portable audio software players allow easy mobility primarily on USB removable devices, such as a flash drive, to output sound on computers. Generally program and windows registry settings are not stored on a computer, other than perhaps temporary settings. 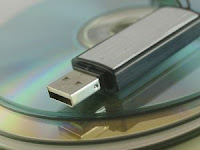 Hence a library of mp3 files, and other audio or video formats can be quickly played , after connecting the USB drive or pen drive to a PC or Notebook. Similar to their desktop versions, they perform reasonably similar, i.e. output sounds to enjoy, or recordings for listening, e.g. student lectures, recorded radio broadcasts, and possibly podcasts. Podcasting has become an important function for many, which continues to grow, with audio download consumption equivalent to video, with about 70 million US citizens watching or listening to a podcast, according to data from Edison Research. Image by Svilen. But today of course, digital hardware mp3 players, smartphones, iPods, iPads, Amazon's kindle, Google's Android, etc, are increasingly used for playing, recording, video viewing, reading, and storing music. Android and iOS continue to increase in market share, with the US smartphone population at about 50 % based upon Comscore, Neilson and Pew Internet Project research . Mobiles offer convenience when on the go for listening, transfer, download, sharing, social networking, etc with other devices. But also general suitability, such as hardware and software upgrades, accessories, wireless or cable interfacing, and more. Compact player with 10 band equalizer with Internet streaming, and high fidelity output. I noticed it's simple library with a range of selections, e.g. FM High Voltage, Top 40, Trance, and more for instant playing. 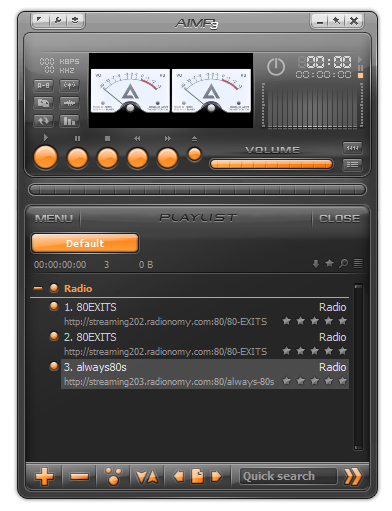 I think it connects to online radio stations at 1.FM. Supports common formats, and has features such as random and repeat play, play list, library, skins, global hot keys, visualizations, about 20 global hot keys, and over 800 skins to download and more. Select the portable version from the main install interface, and when it opens, so does a dialog box to select a range of appearance settings for main and play list layout, and corresponding colours. You may want to leave as is, or enhance it a bit. It's a basic window type player interface, with standard features, equalizer, play list creation, visuals, random play, folder shuffle. But appears to support a range of audio formats, i.e. mp3, flac, wma, mp4, aac, cd, and more. Does have a networking feature under preference, but appears needs setting up, e.g. proxy server. Also advanced settings, e.g. for decoding, scanning, search filters, and for playing. Easily import or drag and drop files to play on this easy to use interface, which supports many formats. These include wma, ogg, wav, cda, aiff, m3u, mod, and others through it's plug ins. Also various skins and visualizations to enjoy. There are numerous system for functionality and refining, e.g. forward and backward frame jumping, favourite playlist creation and export, mixing options (for interpolation, ramping, and surround), media playing from url's, and alter aspect and zoom ratios. But also select title or chapter from DVD menu, load, download, upload subtitles and configure it's settings, alter audio channels, select stereo mode, configure hot keys, and more. Attractive and sleek interface, functional, easy to use, crystal clear sounds, is what I liked. Plus of course hundreds of radio stations from Icecast and Shoutcast. Continual and diverse music if you want it. Relatively easy to customise with presets - e.g. acoustic, pop, techno, metal, jazz, and tons more including importing and exporting. Also auto download lyrics and see the text display, if available, on the R/H side of the playlist., which can be exported in html format. Spider Player supports around 30 formats, and can rip and convert into common formats. But also record, and easily select from 32 kbps to 320 kbps bit rate on a sliding scale for mp3 output. Also includes loss less Internet radio station recording. Select skins, several languages, cross fading, custom and global hot keys. Practical, resourceful, player, recorder, ripper and converter. Small and simple interface mp3 player from Daan Systems, released under the GNU General Public License (GPL) and listed on source forge, a open source centre for software development and distribution. 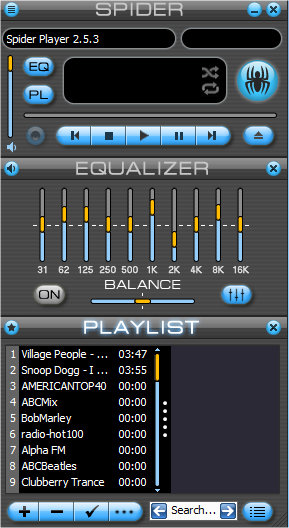 Has continuous play, advanced playlist editor (load, add, save, add directory, etc), 8 band equalizer, ogg vorbis support, convert to wav, ID3 multi-tagger, Internet streaming, a range of optional settings, skins, basic keyboard controls, and other functions. Comprehensive and functional loaded multi media player, with many powerful features for music management. Easily customizable, including skin to suit your needs, and includes for MAC and Android. This includes importing and exporting from itunes, support for multiple audio formats, and video and album artwork display. Also device or services support, e.g. Shoutcast, Concert Look up (powered by Songkick), Digital Store, Apple's Quick time format, Windows Media Player, "mash tape" for web source mashing, Gracenote CD look up, CD ripping, Last FM interaction, MTP and MSC device support and other services. You can browse those services within the program. 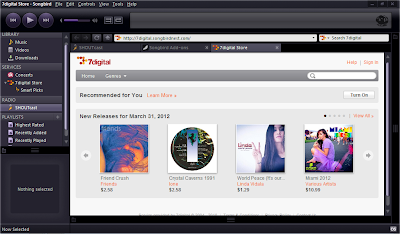 (see my screenshot above for 7 digital store) Also has "watch folders" for auto importing files, comprehensive library management, custom hot keys, gap less playback, and the common play, edit, repeat and equalizer features. Plenty to perform from this iTunes type media manager. The windows explorer style interface allows easy navigation through the folders or directories for easy file playing. 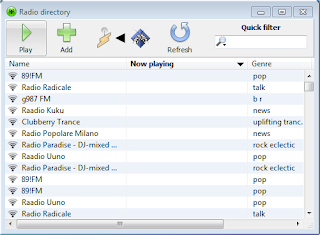 Simple forward and backwards directories search for mp3 and mp2 audio files, with plug in support for Winamp, and enhancer, equalizer presets and decoder settings. Small file size of about 170 kb, and has a compact interface mode and can enable log tracking and audio scrobble. Useful player to quickly display and play large archives of mp3's through it's folder view appearance. The AIMP 3 download file has a option to copy directly to a external drive for the portable version or a full installation. This is a attractive sleek software, with plenty of settings, from it's comprehensive preference settings. 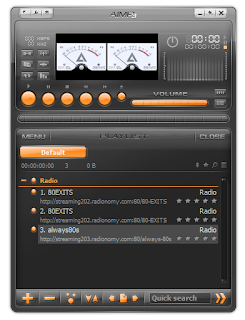 There are 5 categories - Playback - Play list - Player (several file formats) - Plug ins - Interface (Skins). also a Tag Editor, Audio Library, Internet Radio Browser, Scheduler (with alarm), DSP Manager, with tons of settings. Perhaps spend time familiarizing overall, and getting used to the small buttons. You can configure, sort, and search play lists, alter language skins, languages, create hot keys, install plug ins, integrate with windows explorer, export track lists, and more. Also load equalizer presets (e.g. Pop, Party, Live, Jazz, ballad, Full Bass, etc) and add sound effects, e.g. Echo, Reverb, Pitch, Tempo, and more. Listen from dozens of default Internet radio streams from Icecast, and also capture (record) them to hard drive, which defaults as an mp3 file (128 kbps) to your user name documents directory. Has a comprehensive help file, with screenshots, to help make this a quality player to enjoy audio. Don't forget to scan your USB flash drive and other external devices for spyware, malware and viruses, with suitable and free antivirus and related programs. Removable virus procedure (my tutorial article using popular freeware) particularly if you are swapping, storing, transferring, and playing audio (or any) files frequently to other computers. Threats and security issues (pdf white paper report) are possible and potentially damaging, when connected to a network. This includes your home, school, or business network system. 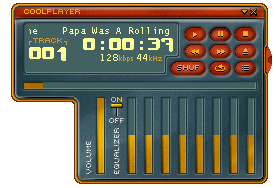 There are many mobile audio freeware players to select for suitability. From simple directory or windows style to more fully featured with enhanced customizable interface. This means simple, quick playing of your mp3's and other music formats, archived files from your or an other's PC. But also optimizing with various inbuilt and external functions. This includes Internet or online features, e.g. 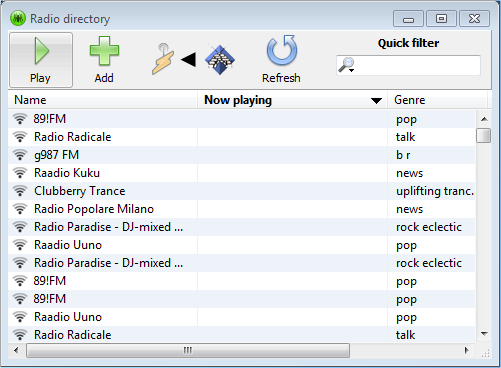 streaming audio from preset radio stations and music related websites, connecting, recording, and integrating online (e.g. Last.fm), purchasing albums, mp3's, and audio books from online stores. But also downloading enhancement plug ins, skins, related utilities, tools, and optimal updates and upgrades. But importantly, simply enjoy playing your USB stored portable audio software and music files on another computer or notebook should such an occasion occur.